Inspired by Apple retail stores, BMW is requiring dealers to hire young, tech-savvy employees to handle questions about its vehicles on the showroom floor. The “BMW Genius Everywhere” program is slated to go nationwide in about a year, with specially trained employees — many of them college students — patrolling dealerships with iPads in hand. The BMW “geniuses” will be available to inform shoppers about vehicles and features, but they will not sell cars. 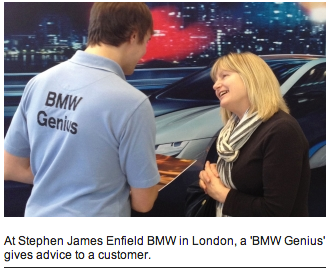 The BMW Geniuses are not salesman, and are paid a salary only – no commission on sales. Instead their approach is said to be similar to that of Genius staff in Apple retail stores – so they act as sort of product ‘explainers and troubleshooters’ – answering questions and offering free technical support. This program was successfully trialed in the UK last year, is rolling out across Europe now, and is set to start in the US later in 2013. Quite a nice bit of work for a tablet that’s supposedly ‘only for consumption’ I’d say. Shocking that BMW didn’t want to go with those tablets with the clicky clicky keyboards and the dancers.